Thus week’s lesson comments on Jeremiah 40-44, looking at the murder of Babylonian-appointed Gedalliah to watch over the Jews who remained in Jerusalem, to the Jews’ begging Jeremiah for a word from the Lord, to God’s clear instruction NOT to return to Egypt, and finally ending with the Jews who remained in the land of Judah returning to Egypt and resuming overt worship of the pagan gods. They shamelessly defended themselves, saying they were experiencing blessing and abundance as they worshiped the queen of heaven. This quote is followed by thought questions about Israel ironically returning to Egypt in a desire to find safety. The lesson then asks won what was we may be tempted to return to Egypt to find what we think we can’t find with the Lord. “With us, everything depends on how we accept the Lord’s terms.” —Ellen G. White, Selected Messages, book 1, p. 118. Why is it a mistake to assume that salvation comes with no condition? Conditions are not the same things as works, or something that gives us merit before God. How can we learn to differentiate between the false teaching of salvation by works (legalism) and the false teaching that salvation is non conditional (cheap grace)? Dwell more on the difficult question at the end of Thursday’s study. If someone says, “I don’t believe in Jesus, I don’t even believe in God, and yet look at how well my life is is going. In fact, I would say that my life is going better than yours, and you are a Christian,” how would you respond? The problem with this lesson is that the entire study is based upon a false foundation. The unclarified assumptions underlying this study of Jeremiah and of the application questions that grow out of it deny the completed blood atonement of the Lord Jesus and the core need to believe God and His word. In this lesson, as in every Adventist interpretation of Scripture, the bottom line is that one must obey the law in order to experience the blessings of God. And Abram said, “Behold, you have given me no offspring, and a member of my household will be my heir.” And behold, the word of the LORD came to him: “This man shall not be your heir; your very own son shall be your heir.” And he brought him outside and said, “Look toward heaven, and number the stars, if you are able to number them.” Then he said to him, “So shall your offspring be.” And he believed the LORD, and he counted it to him as righteousness (Genesis 15:3-6). Never is rote obedience considered to be the way to please God. Rather, it is belief in God’s promises and in His word that is credited as righteousness. Obedience that flows out of this trust is the obedience of faith. In Adventism, obedience of faith is doing the law, thus proving one loves God. In Scripture, the obedience of faith is the fruit of a changed life that has already trusted God completely. The discussion question about differentiating between two kinds of false teaching—legalism and cheap grace—is a straw-man question. We are never asked, as Adventism teaches, to figure out right from wrong, or to distinguish between wrongs. In fact, the notion that we can gain confidence with God through knowing right from wrong was embedded in Satan’s first temptation to Eve. No, what we are asked to do is to trust God’s word. Trusting God’s word takes us to a different question than that of figuring out if one is acting legalistically or assuming cheap grace. The real question is: what have I done with Jesus? The bottom line of life is this: have I believed that Jesus is God’s Son who died for the sins of all men, and have I trusted in Him and repented of my sin? Have I believed that He died for me? Have I been born again of the Spirit? Adventism attempts to analyze salvation, to explain how to think about it and how to “do it” right. The Bible, however, teaches us to subject our minds to God’s word and to deal directly with the Lord Jesus. When we trust Jesus and submit to His word, right and wrong become clear. Jesus said that the work of God was to believe in the One whom He sent (Jn. 6:29). Jesus further said that those who have believed have already passed from death to life (Jn. 5:24). This passage is not figurative or metaphorical; it is actual, real, and current. Paul explains it by saying that when we believe, God transfers us out of the domain of darkness into the kingdom of His beloved Son (Col, 1:13). In fact, Jesus also said that those who have not believed in the Son are “condemned already” (Jn. 3:18). Paul says that we are “by nature children of wrath” (Eph. 2:3). In other words, without believing in Jesus, we are citizens of the kingdom of darkness ruled over by Satan. We are, in fact, born into this kingdom—born spiritually dead. There is no hope for any of us to figure out right from wrong or the differences between false gospels if we do not recognize our depravity and repent of our sin. Unless we believe in the Lord Jesus and trust His blood and His word, we are completely lost, no matter how clever our analysis and cognitive grasp of texts. Moreover, the quality of our lives is never the measure of belief in God. When people attempt to defend unbelief on the basis of quality of life, they are asking a straw-man question. The real issue is: are you alive or dead? Are you still a citizen of the domain of darkness, or have you been transferred by the Father into the kingdom of His Son? Have you been born of the Spirit? Until a person deals with the gospel of the Lord Jesus, none of these questions of obedience, law, right, wrong, or faith make any sense. The Lord Jesus is the great divide. He is not a component of the salvation package: He IS all we need. The Bible promises that God provides all we need when we are His, and it also promises that we will suffer for the name of Christ. The trials of our lives are not the measure of our standing with God. Rather, the presence of the Holy Spirit in us, our identity as God’s adopted children who know by the witness of His Spirit with our spirits that we are His (Rom. 8:14-7) is the way we know we are His. As we trust Him and trust His word, we become more and more rooted in reality. We learn to think and know as He knows, and we begin to reflect Him. The book of Jeremiah is a book that tells the story of Judah’s apostasy, both personal and national, and demonstrates God’s faithfulness to keep the terms of His covenant with Israel and His faithfulness to bless and redeem His own. God’s grace is not limited. It is infinite because it is an attribute of our infinite God. Grace, however, includes God’s justice and discipline and faithfulness. We cannot thwart God’s grace or limit it. Ultimately, there is only one question we must answer: what have we done with Jesus? Do we believe and trust Him, or do we hold our cognitive analysis over His word? Trust and belief require submitting our minds to His word and allowing them to instruct us. God’s word reveals the Author of salvation, and it clarifies that before we can deal with the idea of obedience, we must first believe. 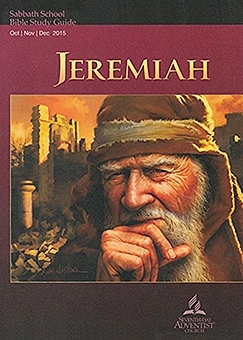 Jeremiah trusted and believed God. He suffered, but he trusted even in the suffering. He did not shift his message to accommodate the fearful and demanding Jews. God asks us to trust and believe Him as Jeremiah did. He does not ask us for a great demonstration of social justice, charity, or self-denial. He asks us to submit our minds and hearts to the Lord Jesus and to be born again. He asks us to repent of our sin and to receive the payment of Jesus’ blood on our account. Copyright 2015 BibleStudiesForAdventists.com. All rights reserved. Revised December 14, 2015. This website is published by Life Assurance Ministries, Camp Verde, Arizona, USA, the publisher of Proclamation! Magazine. Contact email: BibleStudiesForAdventists@gmail.com.